Funeral home records are not a source that is often easily accessible. Therefore, it is most welcome when such records find their way into a public archive. In St. John, Canada, the Brenan Funeral Home records are available at the Provincial Archives of New Brunswick. Some of these records have been transcribed and are available online at the New Brunswick Irish portal website. They cover the time period 1901 to 1960, with a subset of 1136 records—from the full c.32,000— available on this database. One particular use for these records is that they can plug a gap if the death was not registered with the relevant local authorities. The full database and more information about these records are available here. 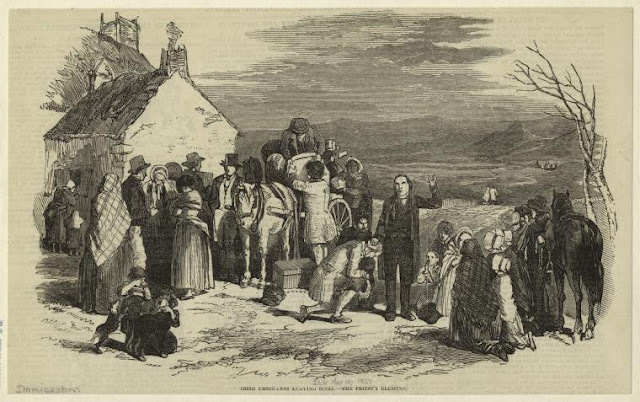 I came across this sad picture, Irish Emigrants Leaving Home - The Priest's Blessing (1851), on the website of the New York Public Library. How many times was this scene repeated as Irish people left during the Famine, never to return? It's a blessing that your ancestors may have received on their journey to the U.S. or Canada. This weeks episode of the American version of Who Do You Think You Are focused on the paternal ancestry of actor Chris O'Donnell. With a surname like that I was hopeful that the show might focus on where his ancestors came from in Ireland. On his tree it was outlined that, along with O'Donnell, he had names such as MacCabe, McEnnis, and McNair. The episode focused on two men, his great-great-grandfather Michael McEnnis, from St. Louis, and an even older ancestor George McNair, from Baltimore. The central theme of the episode was the military service of these two ancestors; McEnnis fought in the Mexican-American War and McNair in the War of 1812. The smart money would say that Chris O'Donnell's ancestors had links with Ulster and various Scots-Irish immigrants. 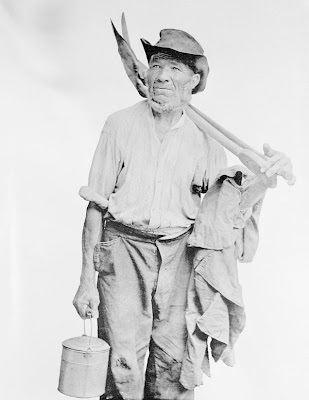 In the show one document outlined that his McEnnis ancestor was the ninth generation of his family to have lived in the U.S., meaning that the original ancestor came to America sometime in the early 18th or even 17th century. These four surnames can also be linked to Ulster and its various counties; McNair as a branch of the Scottish MacNaughton clan found in Ulster, O'Donnell to Donegal, McEnnis to Down, and MacCabe to Cavan. 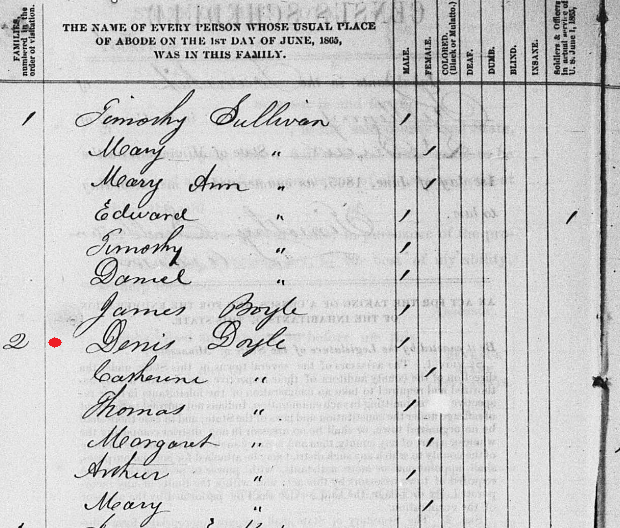 The 1850 U.S. federal census image for Michael McEnnis that was shown in the show didn't focus on the section that listed his wife Eliza as having been born in Ireland. His mother, also Elizabeth McEnnis, listed as living in the same dwelling, had a number of probable borders born in Ireland. They could possibly be relations from the old country. No mention was made of any place in Ireland that an ancestor was from. Of course, there could be a number of reasons for this. It might have been omitted for editorial reasons, or maybe it was not discovered. The second reason is quite plausible as finding the Irish place of origin can be difficult, especially if the various branches of O'Donnell's family came to the U.S. in the years before the American Revolutionary War. Has anyone discovered they are related to Chris O'Donnell, or more importantly when any of your shared Irish ancestors are from? MacLysaght. 1985. p. 140 / This is probably one of the many versions of the name commonly represented as MacGuinness e.g. McGennis, Magennis etc.. Sailing from an English or Scottish port to North America was the route of choice for many Irish emigrants. However, they first had to get to that port before embarking for the U.S. or Canada. 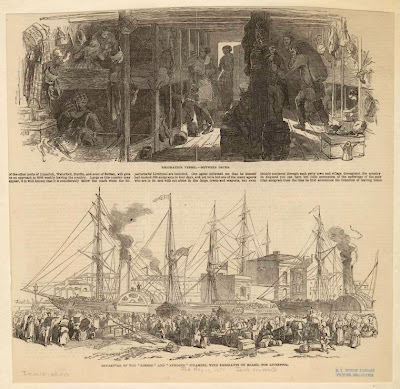 The two pictures below, Departure of the "Nimrod" and "Athlone" steamers, with emigrants on board, for Liverpool and Emigration Vessel—Between Decks, show two such ships leaving Irish ports and the cramped conditions experienced on emigration vessels. They were published in the 10 May 1851 edition of the Illustrated London News. 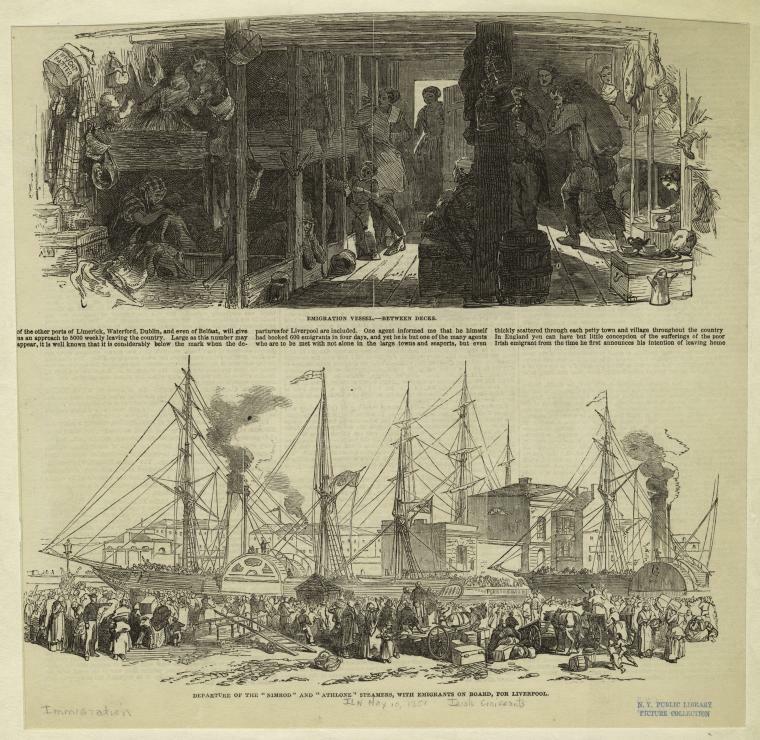 The section of text from the accompanying article reads: "… of the other ports of Limerick, Waterford, Dublin, and even of Belfast, will give us an approach to 5000 weekly leaving the country. Large as this number may appear, it is well known that it is considerably below the mark when the departures for Liverpool are included. One agent informed me that he himself had booked 600 emigrants in four days, and yet he is but one of the many agents who are to be met with not alone in the large towns and seaports, but even thickly scattered through each pretty town and village, throughout the country. 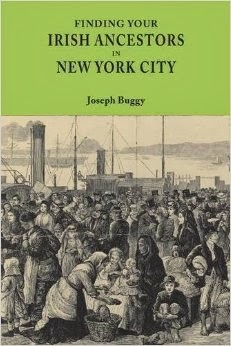 In England you can have but little conception of the suffering of the poor Irish emigrant from the time he first announces his intention of leaving home..."
New York and Boston are often the focal point when it comes to Irish immigration to the U.S. However, there have been a number of very interesting migrations from specific parts of Ireland. Radharc (pronunciation RYE-urk), an Irish production company specializing in documentaries, made The Irish Texans in 1995. It tells the story of a planned settlement of Wexford farmers who came to Texas in 1834. You can find more information about the documentary here. One of those emigrants was Thomas O'Connor (you can read more about him here). He recruited many families from the Ballygarret area of Wexford, where he was from. The Texas Connection: the Story of the Wexford Colony in Refugio contains lists of people who traveled with O'Connor and were granted land in 1834. Some of these names can also be found in evidence from a court case in the 1890s. Roche, Richard. 1989. The Texas Connection: the Story of the Wexford Colony in Refugio. Wexford: Wexford Heritage Committee. McKeehan, Wallace L. "Deposition of William St. John, one of the colonists of the Power-Hewitson Colony, taken during Welder-Lambert Lawsuit, No. 449 in District Court of Refugio County, Texas, 1891" on The Irish Colonies Index; online available at http://www.tamu.edu/faculty/ccbn/dewitt/irishpowhew3.htm: accessed 28 July 2013. I came across this amazing image of an Irish woman, Mrs. Thomas McKessy, Limerick, and her ten children arriving at New York in 1926. The caption says she had 21 children in total! The full New York Times article (which is unrelated to the picture), by the well know Irish author/playwright John Banville, can be accessed here. Their 1926 passenger list (part 1) gives the names of all the McKessy children on the ship. It further outlines that the family was from Newcastle West. 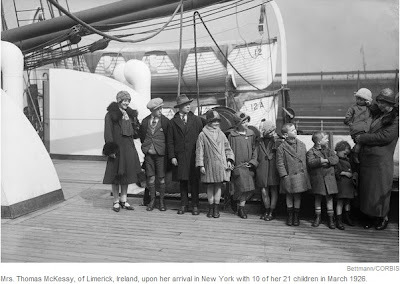 The family sailed from Cobh (Queenstown), Co. Cork on 7 March, arriving in New York. Their father Thomas was already in New York, living in the Bronx (passenger list, part 2). 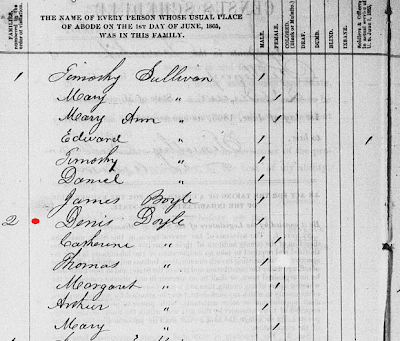 When enumerated in the 1930 census, Thomas McKessy, his wife Sarah, and nine of their children were still living in the Bronx. Daughter Johanna, then aged about twenty, was not listed with the family. In the 1911 census of Ireland there is a family living in Newcastle West that has matching parents' names, their ages are broadly correct, and have numerous children. Two of the children's names, John and Johanna, also match, based on ages listed on the passenger list and both censuses. All the rest of the children on the 1930 schedule had not been born when the 1911 census was taken in Ireland. By 1911 this Sarah McKessy had given birth to eleven children, of which eight had survived. If this is the correct family, did she really have a remarkable twenty one children? Or was it "just" nineteen (including the three children that did not survive childbirth)? What happened to the other two; did they die in childbirth too, between 1911 and 1926? Regardless, how many descendants do all these McKessys have today!? "United States Census, 1930," index and images, FamilySearch (https://familysearch.org/pal:/MM9.1.1/X7D3-94M : accessed 29 Jul 2013), Thomas Mc Kessey, 1930. The National Archives of Ireland, 1911 Census of Ireland, County Limerick, DED Newcastle Urban, Townland/Street South Quay, Form A, Number on Form B 1 (stamped),house 19, Thomas MacKessy; digital image, The National Archives of Ireland, http://census.nationalarchives.ie/reels/nai002783923/: accessed 28 July 2013; original manuscript not cited. I came across this simple picture, Irish Navvy. No concrete date is know, but it was taken sometime after 1858, probably in the 19th century. It is a part of the A.E. Young Collection at Library and Archives Canada. Planes, trains and automobiles are the types of transport that people use today when migrating from Ireland to the United States. But what about in the 18th century? Obviously, they came to the U.S. by ship, but there was still a considerable distance to cover to reach their final destination. 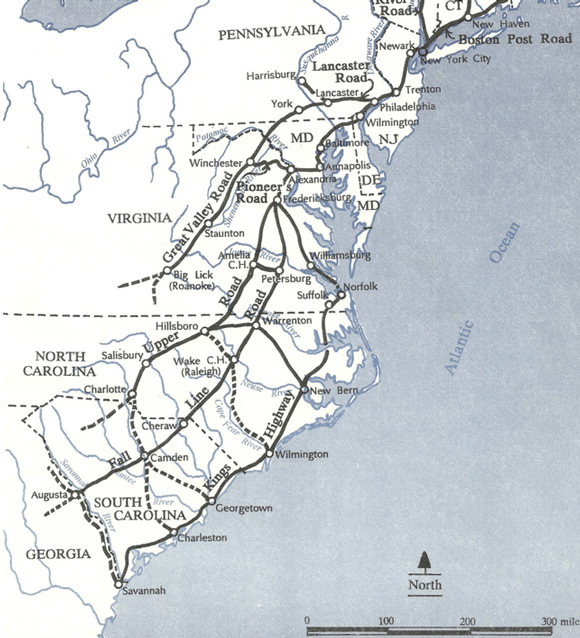 An excellent article by William Dollarhide, Get On Board the Great Valley Road, outlines the history and geography of colonial wagon trails that linked the ports of the east coast to the then interior of the Carolinas and Virginia. The mostly Scots-Irish immigrants from Ireland would have used these trails to reach their destinations. 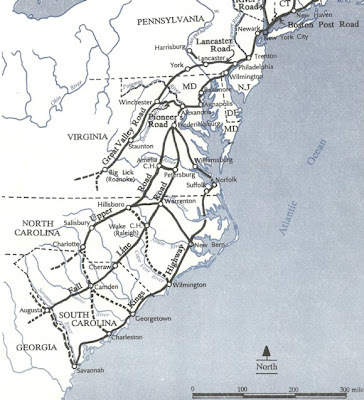 Colonial routes of the eastern U.S. The article further discusses how a knowledge of these routes, and which counties they passed through, is a useful methodological approach for tracing ancestors who traveled them. It is also a very good example of how the opening of a new route across mountains can influence the port of choice for immigrants. In this article you will see that Philadelphia was the destination of choice. Once the Pioneer Road opened further to the south across the Blue Ridge Mountains, then Alexandria, VA became an important port for the Scots-Irish. You can read the article here.